Projects I have contributed to or worked on by myself. December 2015 - April 2017. A mobile fantasy turn-based RPG about four young adults on their quest to find their way back home. Worked on main character concepts. December 2014 - June 2015. C++ using the SFML and Thor libraries. 2D arena fighter with custom physics where the environment is the weapon. Worked on all art assets except for background art. Game won UCSC's The Sammy Awards for Grand Prize and Peer Choice in 2015! A fantasy adventure visual novel with RPG elements! The story has several different endings with five different girls. For Yuri Gam Jam 2016. Worked on story, talking sprites and designing NPCs. Helped with eventing, and received help on writing the story. Demo available for download on Windows and MAC OSX. 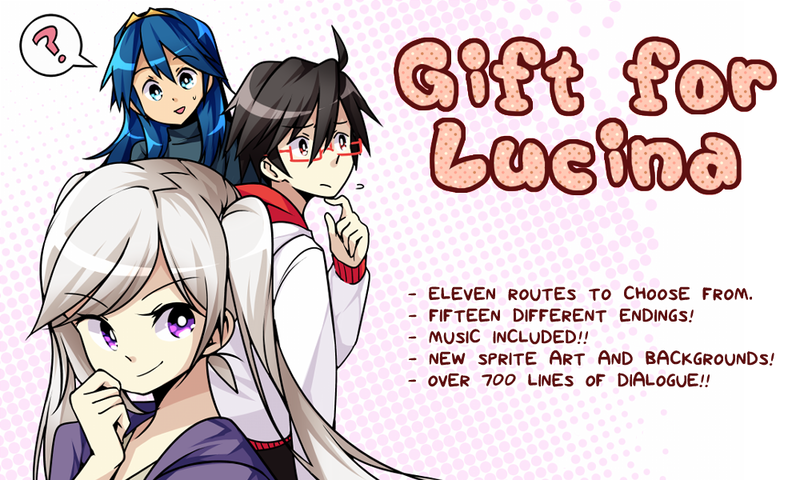 A fan visual novel set in a modern little town. Robin, a young man who rarely leaves his house, is invited by his best friend Lucina to hang out on her birthday. Needing to get her a present, Robin ventures outside to meet her friends who can help him choose the best gift for Lucina! A downloadable remake of the 2014 browser game with updated art and expansion on routes and another character to play as. Worked on programming, the story and the sprites. Disclaimer: The characters are from Nintendo's franchises; the design of Kirby and Jigglypuff are my own. December 2014 - March 2015. A very short adventure game where you play as a young kid helping a ghost boy remember how he died by going through his memories. A game I created to teach myself how to use RPG Maker. Worked on story, art, and had help with programming and eventing. September 2013 - June 2014. An isometric rhythm game where deadly obstacles are in sync with the music. Move to the beat and make it out alive! Worked on all the art assets (playable character design, character animations, and tile designs). Game won UCSC's The Sammy Awards for Visual Art Style and Peer Choice in 2014! Also the first runner-up for the Grand Prize. A ghost story/survival horror platformer about a young girl trying to find her older brother. For RMN's All Hallows' Eve 2015 game jam. Worked on the main character designs, sprites, animation, and story. 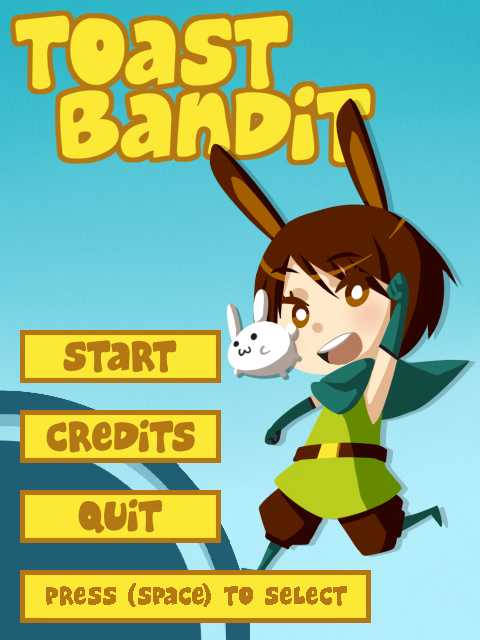 A miniature bullet hell game of a young rabbit trying to retrieve her toast back from a fox thief. Created as a gift for a friend. Worked on all the art and story. On July 15th, permission was given for distribution! I Want to Marry the Princess. September 2015 - October 2015. A timed platformer game about a young female knight, Ellyn, trying to stop her Princess Clover's marriage ceremony from happening. For Yuri Game Jam 2015. Worked on story, sprite art, and animation. itch.io Site (Windows and Mac Download). Gift for Lucina. December 2014. A browser-based fan visual novel set in a modern little town. Robin, a young man who rarely leaves his room, is invited by his best friend Lucina to hang out on her birthday. Needing to get her a present, Robin ventures outside to meet her friends who can help him choose the best gift for Lucina! Created in two weeks as a final project for UCSC's ART 119-2: Storyboarding for Artists. Worked on the story and the sprites. Disclaimer: The characters are from Nintendo's franchises; the design of Kirby and Gekkouga are my own. Play Game. Shippu la Senpu. April 2014 - June 2014. An fanmade arcade shoot-em-up under the top down perspective of TRIGGER's Kill la Kill. Play as Matoi Ryuko and fight hordes of COVERS enemies and the arch nemesis pair, Harime Nui and Kiryuin Ragyo. Aside from fighting and keeping yourself safe, you also have to protect your best friend Mankanshoku Mako and the Naked Sun battleship that follows closely behind the player. Worked on the design and line art for the select screen, cut-ins, and game over screen. RMN site (Windows and Mac Download). Now We're Cooking! September 2013 - June 2014. A mobile cooking/strategy game that takes place in a reality cooking television show in which the host has turned all the food evil. Players must successfully cook the food and before it reaches the player's chef who are desperately trying to fight them off. Worked on concept art, chef sprite, chef animation, and title screen. Was once available on Google Play. Pixture. September 2012 - June 2013. A mobile device word/puzzle game where you help an alien friend with your knowledge of the world. Worked on animation of several pixel sprites in the last three months before distribution. Was once available on Google Play and Apple App Store. Half/Way. January 2013 - March 2013. A multiplayer game on the Microsoft Surface where two players try to cross obstacles to reach halfway of the screen. Originally a project for UCSC's CMPS179: Game Design Practicum, a class sponsored by Microsoft and using Microsoft technologies. Worked on all the art assets. Devil's Advent. April 2012 - June 2012. A platforming-action game made in UCSC’s CMPS 80K about a young fighter who battles his way to the top of the status hierarchy. Worked on the art, UI, and animation. Windows Download. Paint Tool Sai and Mangastudio 5. Once known as the greatest detective of Noa City, a dangerous case has left Tantei-san with little to no memory of herself and a body she wasn’t used to. Thanks to her friends, she was able to close the case before retiring, but still helps anyone in need of her service! These stories take place after the original series run which has been left incomplete. However, it’s not necessary to know to enjoy as the book will go into each character’s past and present. A spiritual successor to Loli Detective. 40 pages (36 pages of art and comics, including 7 guest artists’ works). Read left to right. My Junior is a Demon! Paint Tool Sai, Mangastudio 5, and Mangastudio 4 Debut. A comic of about a 3rd year student, Tsuyoshi Jin, who can see spirits for as long as he can remember. To escape constant bullying by students and staff, the Headmaster transfers Jin into a night class for his final year of high school. What he didn't expect was a class filled with demons! A story of a human boy growing in an extra ordinary world where he meets a young demon girl and her peers who care about him in their own demon-like ways. The oneshot was written for UCSC's ART 119-2: Storyboarding for Artists. Reads right to left. December 2013 - February 2014. A fan comic of Dante and Amaterasu from Devil May Cry 3 and Okami, respectively. Takes place in the crossover fighting game, Marvel vs Capcom 3. 36 pages. Reads right to left. Mangastudio 4 Debut. 5.5″ x 7.5″. A four-page story entry for a Pokemon fanzine, Pokestory. Reads left to right. Available to read online. Loli Detective. (incomplete) April 2011 - October 2014. Mangastudio 4 Debut. 7.17″ x 10.12″. A comic of a young detective, known as the Loli Detective, and her sidekick beardog who solve many mysteries together. The story is about a large case of young girls disappearing which was linked to an incident that happened two years ago which involved the Loli Detective and her beardog. The story stopped in August 2012 when it was updated on Tumblr and was rebooted in April 2014 for an independent studio class. Reads left to right. Available to read online. Pen and Paper, Paint Tool Sai. A fan art and comic book of characters from Ultimate Marvel vs Capcom 3. Made for the game's fifth anniversary. 95 pages. Reads left to right. A fan artbook of characters from ZUN's Project Touhou series. 36 pages. Reads left to right. June 2014 - July 2014. A fan artbook of Dante and Amaterasu from Devil May Cry 3 and Okami, respectively. Takes place in the crossover fighting game, Marvel vs Capcom 3 although heavily centers around the two characters' relationship with each other and their friends. R-16. 48 pages. Reads left to right. Paint Tool Sai and InDesign. A sketch booklet of Amaterasu from Okami drawn as a human by my design. Art pieces and sketches within the booklet are from late 2011 to early 2014. 32 pages. Reads left to right. November 2016 - May 2017. An art book I organized by myself. Multiple characters from Cygame's Granblue Fantasydrawn and collaborated by 70+ artists. 100 pages. Reads left to right. Paint Tool Sai, Clip Paint Studio, Photoshop CS2. 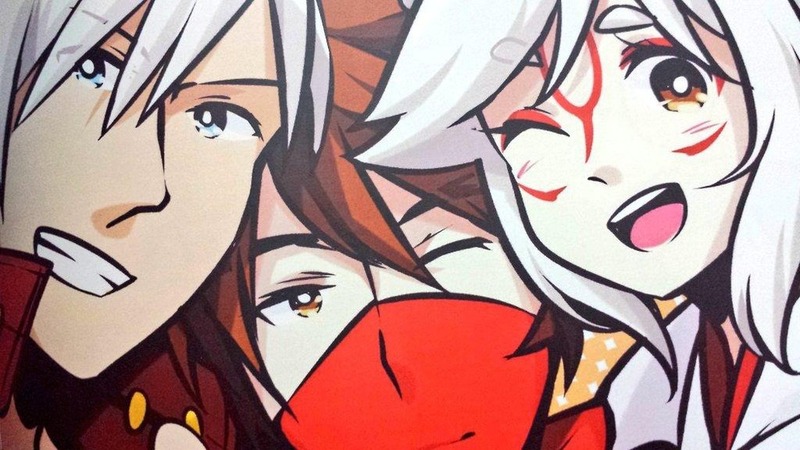 A fan art book of multiple characters from Guilty Gear. Organized by myself. 12 guest artists. 36 pages. Reads left to right. Mentioned in Trending Geek’s “NorCalRegionals Recap: When fighting brings gamers together” by FusRohDan (2018). Introducing the CEOtaku Mascot Shiyo! (2015). Mentioned in Huffington Post's "Artists Organize an Awesome New Take on Katamari Damacy" by Simone Collins (2014). Neko's Shiritori Interview with Shunao by Amoirsp (2013).